SHOWERS & THUNDERSTORMS WILL INCREASE IN COVERAGE BY LATE THIS AFTERNOON & PERSIST THROUGH TONIGHT, ESPECIALLY WEST OF A BLOOMINGTON TO DECATUR TO TAYLORVILLE LINE, WITH LOCALLY HEAVY RAINS POSSIBLE. SOME OF THE THUNDERSTORMS COULD PRODUCE 2 TO 3 INCHES OF RAIN IN THIS AREA. THIS COULD LEAD TO FLASH FLOODING IN LOW-LYING.URBAN OR POOR DRAINAGE AREAS. A FLOOD WATCH MEANS THAT CONDITIONS ARE FAVORABLE FOR HEAVY RAIN ACROSS THE WATCH AREA, WHICH MAY LEAD TO FLOODING ALONG AREA RIVERS. IF YOU ARE IN THE WATCH AREA, CHECK YOUR PREPAREDNESS REQUIREMENTS, ESPECIALLY IF YOU HAVE INTERESTS ALONG AREA RIVERS. KEEP INFORMED.& BE READY FOR ACTION IF FLOODING IS OBSERVED OR IF A FLOOD WARNING IS ISSUED. DO NOT DRIVE YOUR VEHICLE INTO AREAS WHERE THE WATER COVERS THE ROADWAY. THE WATER DEPTH MAY BE TOO GREAT TO ALLOW YOUR CAR TO CROSS SAFELY. VEHICLES CAUGHT IN RISING WATER SHOULD BE ABANDONED QUICKLY. 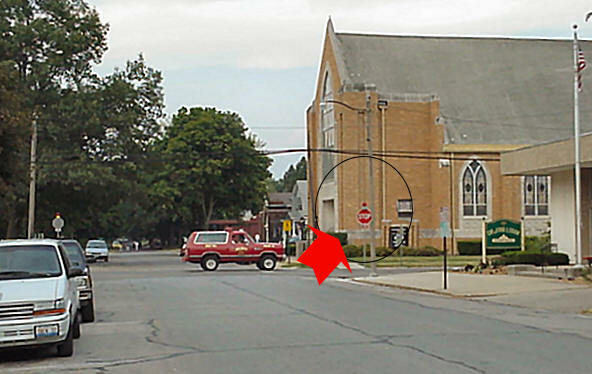 A new stop sign at the corner of McLean and Pekin streets. [Picture by Jan Youngquist] Click on picture for larger image. Invention Mysteries: Who were Fahrenheit, Celsius, Doppler and Richter?